Simon & Schuster/Paula Wiseman Books, 9781442412583, 40pp. Take a deep breath and dive into a day in the life of a baby whale, told with luminous illustrations and spare text, with a fresh twist on a timeless message. Swim! Play all day. Breathe. This simply told story follows a young whale on a journey of discovery as he experiences his first day at sea on his own! He swims, explores, and makes friends in his marine habitat. After a day of independence, this little whale delights in returning home to his mother. Young readers will be drawn to Scott Magoon’s reassuring story of adventure. A very young white whale swims into the wider world of the arctic seas, celebrating first adventures of the very young. With the encouragement of its mother, a young whale spends the day exploring, making new friends, finding shipwrecks, and swimming past glaciers, while intermittently pausing to “breathe” during its busy day. When the whale encounters a polar bear and becomes frightened, its mother soon reappears and assures its safety. 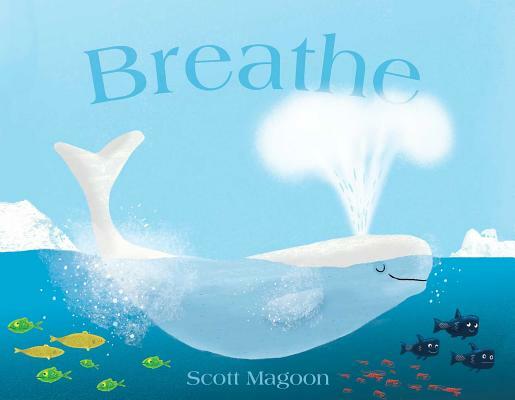 This comforting tale not only gives youngsters the opportunity to explore the ocean alongside a whale but also subtly reminds them of the importance of slowing down to take a break every once in a while. Magoon’s illustrations, which were rendered digitally, are vibrant and expansive, each filling a spread with vivid shades of blue. The minimal text is laid out in clear, big font, supporting the impressive illustrations without ever overshadowing them. With its succinct text and sprawling pictures, this story is perfectly suitable as a read-aloud. Pair it with Stephanie St. Pierre’s What the Sea Saw (Peachtree, 2006) for a gentle, ocean-themed storytime. colors tell this story about the joys of exploring our world. In this arctic, glacial tale, little whale is pushed by his mother to experience life at its fullest and savor the full spectrum of emotions and experiences encountered daily in his world above and below the ocean waves. Magoon uses few words and simple sentences making this an ideal title for young readers. Additionally, his use of uncomplicated illustrations, mostly in shades of blue, lend a coolness to the feeling of the story, allowing the reader to practically experience the chill of the waters where little whale lives. Richly composed and sweetly appealing—just right for baby storytimes as well as one-to-one sharing.